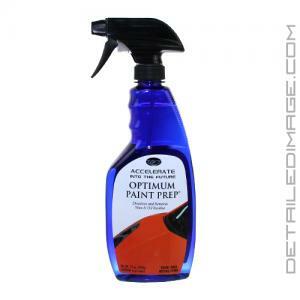 Optimum Paint Prep is the perfect product to use on your paint before applying a coating (i.e. Optimum Gloss-Coat). Before applying a coating we always recommend thoroughly washing and polishing the paint to "lock in" that perfect shine. The issue that arises is that there are often oils in polishes that can remain on the paint and hurt how a coating, or any other form of protection, bonds to the surface. Leftover wax can also prevent bonding so it's critical to remove all traces. Paint Prep will clean the surface, ensuring that it is free from these oils and wax residue so you are ready for a coating, wax or sealant application. Your protection will apply with ease and bond with the surface properly for maximum durability after using this cleaner. Just mist Paint Prep on the paint and wipe it away with a clean microfiber towel. You will see and feel any a squeaky clean shine that will allow you to apply any form of protection (Waxes, Sealants, Coatings) on top of. If you are looking for an easy to use product to leave the paint in pristine condition for protection application, the Optimum Paint Prep is a great choice! Optimum Paint Prep is an excellent cleaner for removing polish residue or old wax before applying polish residue or old wax before applying any of Optimum Coatings or any other coatings or waxes. A combination of mild solvents dissolves and removes all the contaminants and leaves the paint squeaky clean and ready for the final protection. Optimum Paint Prep does not contain any oils or surfactants and leaves no residue behind. You can use it for cleaning all interior or exterior surfaces whenever a clean surface is desired. DIRECTIONS: Simply spray Optimum Paint Prep on the surface to be cleaned and wipe off with a clean dry microfiber towel till there is no residue left. The paint should feel squeaky clean after this step. Repeat the process if needed. I have never made my own IPA or purchased one before. I bought the spray bottle size and I really liked the results. When it ran out I bought the gallon. Paint is squeaky clean after using it. Used before applying a competing brand's SiO2 coating. Works better than IPA in my opinion, seems to get deep down to all layers of protection and strip them out. For the price, you cannot beat it. Perfect product to use prior to applying Optimum Gloss Coat. It works great prior to using opti-seal as well. It allows for product synergy. It states right on the bottle that is leaves no surfactants behind. That is a huge plus. I like it better than CarPro Eraser.